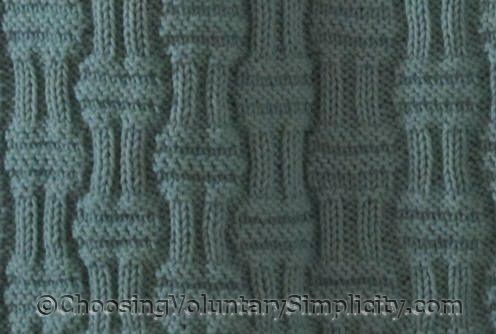 I love the way simple knit and purl stitches combine in this pattern to look like real basket weaving. This basket weave stitch is a reversible stitch, and the back of the pattern looks exactly like the front, so there is no right or wrong side to the afghan. I added a simple garter stitch border on all four sides. Here is the basket weave stitch pattern… it’s a multiple of 18 + 10 stitches. Row 1: Knit 11, * purl 2, knit 2, purl 2, knit 12; repeat from * to last 17 stitches, purl 2, knit 2, purl 2, knit 11. Row 2: Purl 1, * knit 8, [purl 2, knit 2] twice, purl 2; repeat from * to last 9 stitches, knit 8, purl 1. Row 3: Knit 1, * purl 8, [knit 2, purl 2] twice, knit 2; repeat from * to last 9 stitches, purl 8, knit 1. Row 4: Purl 11, * knit 2, purl 2, knit 2, purl 12; repeat from * to last 17 stitches, knit 2, purl 2, knit 2, purl 11. Repeat the last four rows once more. Row 10: [Purl 2, knit 2] twice, purl 12, * knit 2, purl 2, knit 2, purl 12; repeat from * to last 8 stitches, [knit 2, purl 2] twice. Row 11: [Knit 2, purl 2] twice, knit 2, * purl 8, [knit 2, purl 2] twice, knit 2; repeat from * to end. Row 12: [Purl 2, knit 2] twice, purl 2, * knit 8, [purl 2, knit 2] twice, purl 2; repeat from * to end. Row 13: [Knit 2, purl 2] twice, knit 12, * purl 2, knit 2, purl 2, knit 12; repeat from * to last 8 stitches, [purl 2, knit 2] twice. Repeat these eighteen rows for the pattern. I found this pattern in a book of knitting stitches that was given to me as a gift. The book has hundreds of different knitting and purl pattern stitches that can be used for any project… but the instructions lack specific information about gauge or yarn or needle size because these patterns are intended for use in many different types of projects. I made this particular afghan with my usual size 10 1/2 or 11 circular needles and worsted weight yarn. I don’t remember how many stitches I used, but I made a swatch of the eighteen rows in the pattern above first, measured it, and then figured out how many repeats of the pattern I needed to make the size afghan I wanted to make. 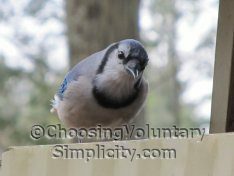 This is not a difficult pattern as long as you pay close attention to the commas, brackets, and semi-colons… and which row you’re currently working on. A magnetic strip to mark the current row makes following a multi-row pattern like this much easier. Oooh! I love it and think I’m going to try this as a jacket! Wouldn’t that be cool? This is an especially pretty basket weave. Thanks for sharing. 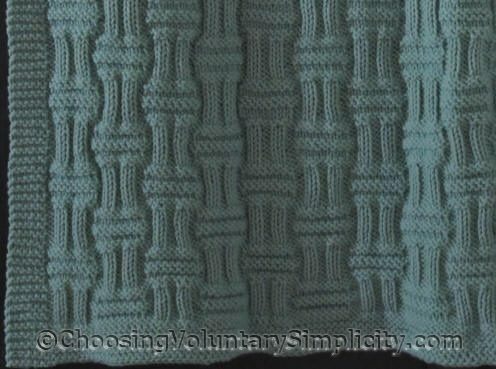 That is the most beautiful basket weave stitch I have ever seen. I’m a semi beginner at knitting. I did quite a bit of knitting when I was young but I haven’t done any for years and years. This afghan has inspired me to get out the yarn and needles and see if these arthritic hands of mine remember what to do. Once again thanks for a most interesting site. Ooooooooh! I *SO* want to try this! I’m not sure I have the skill though. I know you said it wasn’t difficult but it sure does look complicated. So beautiful. I really like the reversable part. I made a pattern that was called basket weave but it was only squares of different texture, nothing like this. I have read over the pattern and tried to visualize if it was something I could do and I think it is. Thanks for sharing this. Just lovely. You should be proud of your beautiful work. I really like this blanket and search it for the long time. I want knit blanket for my niece. Thank for sharing this pattern. I am so happy I have found you.